I think a "wealth of knowledge" might be an understatement for you, Whoda. 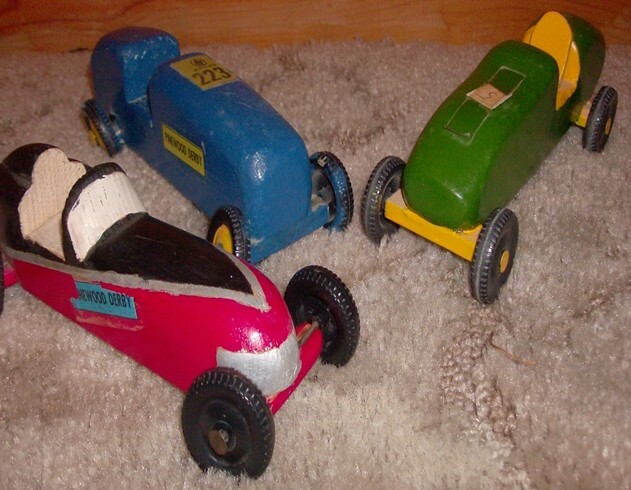 I'm wondering if there is anyone in the U.S., or perhaps anywhere, that knows something about the Pinewood Derby and its details from 1953 to 2016 that you don't know. If some one, somewhere, thinks they know more, it would be great if you two got together and shared all your knowledge with each other. What a Hard Bound book that would make ! From this point on all things published by the Boy Scouts about the Pinewood Derby could be collected. Nothing would be lost to History. Maybe we could get Randy Lisano involved because of his fantastic Software. The Software just keeps getting better and better. I'm honored by your kind words guys. I wish I knew everything about it .. but I don't! I have a felling that there is more information out there to be discovered and to collect.. and that it is in sharing it's history with others. Here is that early PWD ad with the price seen on it .. this PWD ad was discovered in an early Cub Scout Regatta boxed kit. Sorry i could not find it in my photos at the time. After sleeping on some thoughts last night! But as i put some more thought into it based off some of the things i think i know about its kit history and kit changes. Here is what my thoughts are telling me . Here is an Nov-Dec 1974 article that was shared with me by Jeff of pinewood Project! look at what the kids are asking for in the article .. New Version of an Old Winner. Based off of the catalog number seen for the Cub Scout kit as 1699 also and what is also seen on the notice on top of the instruction sheet. My thoughts are telling me this has to be where this Cub Scout version kit fit's in as a collector. The CMI kits also offered a new wide track wheel style with a hub. As for the vintage decal name plates threw the years.. Another way to look at it! Is that the builder could have used the left over decals from years before as well. I still tossing the idea around about writing one and have been looking into it. It took some doing to get the camera angle just right to pick up on the mold number and hub on this Cub Scout wider wheel type. The wide Cub Scout wheel in question will be seen setting beside some CMI wheels in the photos. Here is a close up of the inside hubs. And the mold number seen as a # 4 on the wide Cub Scout wheel to the left hand side CMI Wheel to the right hand side . Close up of the two wheel types front and back sides views of the wheels. And what this wider Cub Scout wheel type looks like from a side by side view to a 1956 beta crafts wheel..
Just check out the larger dome style to the outer hub seen to the right hand side. as far back as 1963. DerbyGuyDoug wrote: As long as I've been collecting I've only run into 2 cars with this set up, I actually purchased the 2nd one I found. Because of the oddity, because of the rarity, I have to think these are early. As long as I've have been collecting I myself have only run into 2 cars using this wider wheel and hub style set up. Back when I first started here on Derby Talk .. I asked FS if he could help me with this wheel he thought I was showing off at the time! Well maybe I was because I had a car and an 8 car bulk set kit with this wheel type .. back when I first started talking and sharing pics. I also shared the car plans from the kit, FS shared with me how the Lion Rank was also seen in the car plan as well..
and how in 1964 this rank was no longer. This topic on the wider Cub Scout wheel style really had me wanting to put a true date to this wheel style or on a year used as a collector stand point. And to help out with any Information about them that I could ! Here is a pic of 2 cars that I now have in a collection with this wheel style. The gold and red car seen on bottom that's modeled after what look's to be a Mercedes w-165 . Was my 2nd discovery of a car using this wheel style! The 8 car Cub Scout bulk set kit with the same wheel type seen in the photos way above.. was my 1st discovery of it's kit & wheel type. Note: the wheels seen on the Mercedes looking car at the very bottom are running the hub's outward & that it also looks to be using a 1970's CMI kit style. The brown stained car seen with gold paint on the wheels is running with this same wheel style .. but is in the 1950's - 60's kit style. The car seen on top in the 50's-60's kit style with the trophy is my latest discovery with a car using this same wheel style . Note: the trophy is dated 1963! Here is a closer look at the hub and wheel style seen being used on that car. Here are some pic's of a different Pinewood derby wheel style that almost looks the same . Note: the different style wheels will be seen on the very bottom in the pic . The Cub Scout wheels will be seen on top... left to right inner and outer views of the wheel types. Note: the wheel seen to the right hand side is just a smidgen taller and has a little bit different tread profile. I believe this different wheel style to be an early Royal Ambassadors wheel because of the much larger wheel bore size. And there the only Pinewood Derby wheel type that I know of that even comes close to the Cub Scout wheel type as far as looks to the inner hub style. Hope this new traded information helps you out Doug! As it's all I know so far about Cub Scout wheel type to maybe put a date to there kit style or for a year used. Here is a little more info on this wheel style and the mold numbers .. after running across three more vintage derby cars using this wheel type. The mold numbers iv seen for the wheels run 1- 24 ( 24) being the highest mold number so far for this wheel style with the hub. Close up photo of the cars.. wheels and hubs seen. And this google search pic.. of some cars using this same wheel style as well. What's strange is how the hubs are see turned out .. just like the gold & red car photos i shared way above that was my very first discovery of this wheel type. It would be nice to put a true date to this Cub Scout version kit and wheel style.. for now best I can do for a date used is 1963. If only there was to find out when the mold numbering system was first used for the wheels.